On Friday, April 5, at 8 pm at Glenn Gould Studio, conductor Nurhan Arman will lead Sinfonia Toronto in a concert titled BACH / BRAHMS / VASKS. The concert will feature the Canadian premiere of Peteris Vasks’ Concerto for Viola and String Orchestra, with the brilliant Canadian violist Marina Thibeault as featured soloist. The program will also include JS Bach’s Suite in B Minor for Flute and Strings, with Italian flutist Mario Carbotta, and Brahms’ famous Variations on a Theme by Haydn. Vasks’s Concerto for Viola and String Orchestra was co-commissioned by BBC Radio, the Glamorgan Festival in Wales and l’Orchestre Philharmonique de Strasbourg and given its world premiere at the festival in 2016. Its warm, sonorous writing for the orchestra supports the soloist through dramatic technical challenges in two central movements; the rhythmic fast movement is propelled by almost non-stop imitation and dialogue. Almost exactly two years ago, Sinfonia Toronto played the Toronto premiere of Vasks’ Violin Concerto 'Distant Light' with Andrea Tyniec as violin soloist – probably the second performance in Canada, if not in North America, following the 1999 Toronto performance directed by Juris Kenins. 'Distant Light' delighted the orchestra and audience, leading to Maestro Arman’s decision to play the Viola Concerto this season. Hailed as “A World-Class Orchestra” on its German tour, Sinfonia Toronto is celebrating its 20th Anniversary season in 2018-2019. As well as presenting Masterpiece Series concerts in Glenn Gould Studio and George Weston Recital Hall, the orchestra has toured in Argentina, Germany, Peru, Spain, Uruguay and the US. It has released four CD’s, including a JUNO Award winner, and performs in schools and other Ontario cities. Violist Marina Thibeault was the youngest violin student ever to enter the Conservatoire de Musique de Québec. She holds a bachelors from Curtis, has attended the Conservatorio della Svizzera Italiana, and earned her masters at McGill, where she is also pursuing doctoral studies. She has won first prizes in the Prix d’Europe, McGill Concerto Competition and the 2007 Radio-Canada “Young Artist” prize. Flutist Mario Carbotta has performed with too many orchestras to count. A very short list should include the Mannheim Chamber Orchestra, Mainz Chamber Orchestra, Prague Virtuosi, Strings of La Scala, Vienna Tonkünstler, Südwestdeutsche Philharmonie, Deutsches Kammerorchester and San Remo Philharmonic, but there are dozens more. He is one of the world’s most-recorded flutists, with releases on four European labels, and is a professor at the Boccherini Conservatory in Lucca. Tickets are available online at sinfoniatoronto.com or by calling 416.499.0403. Toronto, ON - Sinfonia Toronto has just announced its 2019-20 concert season. This will mark the orchestra's 21st year of musical activities in Toronto and throughout Ontario, performing in cities from Brockville to Sarnia and appearing annually on the Barrie Concert Series and the Algoma Conservatory Series in Sault Ste-Marie. During the 2019-2020 season Sinfonia Toronto will continue presenting its 7-concert Masterpiece Series, Downtown Concerts at Glenn Gould Studio and North York Concerts in George Weston Recital Hall at the Toronto Centre for the Arts. The orchestra will also present programs for schools in Toronto's Neighborhood Improvement Areas and travel to Barrie in October and January and Sault Ste-Marie in April. The orchestra has been invited to tour China for three weeks in September 2019. The orchestra has previously toured in the US and twice in Europe and last April made a highly successful two-week tour in Argentina, Peru and Uruguay. Sinfonia Toronto has recorded four CD’s, including a Juno winner. Season highlights will include performances of Beethoven’s Symphony No. 6, the “Pastoral,” and his Triple Concerto, both in 19th century chamber orchestra versions; world premieres by Toronto composer Larisa Kuzmenko, Turkish composer Tahsin Incirci and Toronto premieres of works by Airat Ichmouratov, Alberto Ginastera and Grazyna Bacewicz. Toronto - The recently completed 2017-2018 audit confirmed that Sinfonia Toronto has erased the last small deficit amount remaining from three seasons ago. "This is a very welcome verification," said Margaret Chasins, the orchestra's Director of Operations. "We have been working systematically to erase the accumulated deficit even though many expenses such as hall rentals keep increasing from year to year." "There is more good news as we celebrate the orchestra's 20th Anniversary. Subscriptions are up by 17%, on top of increased sales last season also; and our single ticket sales to date are almost double last season's at the same time. This is all especially positive, because many North American orchestras are reporting reduced subscription sales and lower attendance in general... This is a huge bravo for the orchestra, and great evidence of Toronto's robust cultural scene." "The orchestra is in superb shape artistically, and there's great energy and 'buzz' among the audience at each concert. The orchestra's artistic success is drawing notice internationally as well - soon after last April's successful tour in South America we received an invitation for a three-week tour in China next September. So all in all this anniversary season is a really feel-good time. Increasing ticket sales won't cover all our concert costs, and we still face the same funding challenges as always; but we do have a lot to celebrate this year." Considered one of Canada’s finest chamber orchestras, Sinfonia Toronto performs its Masterpiece Series in CBC’s Glenn Gould Studio and the Toronto Centre for the Arts. The orchestra has recorded on its own label and for Marquis Classics EMI, Cambria and Analekta. It tours regularly throughout Ontario, performing annually in Barrie and Sault Ste-Marie, and has performed in Montreal and toured internationally in Germany, Spain, the US, Peru, Argentina and Uruguay. Toronto – Sinfonia Toronto will open its 2018-19 Downtown Concerts series with a program titled ’Rachmaninoff’. The orchestra’s Music Director Nurhan Arman will conduct the November 16 concert in Glenn Gould Studio, featuring brilliant Canadian pianist Anne Louise-Turgeon. She will appear as soloist in Rachmaninoff’s beloved ‘Rhapsody on a Theme by Paganini’ in a chamber orchestra version created by Parisian composer Louis Sauter. The performance will mark the Canadian premiere of this transcription. Also on the program are two sparkling 20th century compositions by Albert Roussel and Polish composer Grazyna Bacewicz. Anne Louise-Turgeon has taken prizes in the Cleveland and Sydney International Piano Competitions, a Government of Canada Award for Achievement in the Arts and an Ontario Arts Council Chalmers Award for advanced solo studies. She appears on Albany Records performing solo piano music by Ezra Laderman. She has appeared at the Concertgebouw of Amsterdam, Carnegie Hall’s “Weill Recital Hall”, Sinfonia Toronto, Music Toronto, Hamilton Philharmonic, Massey Hall (Toronto), New World Symphony, Minsk Philharmonic, Festival Miami, FIU Stravinsky Symposium, Esprit Orchestra, Sanibel Chamber Festival, Norfolk Chamber Festival, Austin Chamber Festival, Novosibirsk Philharmonic, San Francisco International Chamber Festival, Montreal International Two Piano Festival, Yong Siew Toh Conservatory (Singapore), Chicago International Two Piano Festival, Salkind Two Piano Festival, Festival Duettissimo, Dranoff Foundation and the World Piano Conference. She has given world premiere performances of works by Copland, Corigliano and Pauk. Radio and television appearances include ABC (Australian Broadcasting Corp.), Netherlands Public Radio, CBC I & II, “Arts National”, NPR “Performance Today”, BBC I & II, WGBH Boston, WPR, WFMT Chicago, MPR, and the PBS documentary “Two Pianos – One Passion”. As a member of Duo Turgeon, Dr. Louise-Turgeon took first prize in the International Schubert Competition (Czech Republic) and the Murray Dranoff International Two Piano Competition. Her recordings on Vanguard Classics, Marquis Classics, Marquis/EMI, Dranoff Foundation, ClassXdiscs, and Albany labels have received acclaim, including 5 out of 5 from la Scena Musicale, CBC “Sound Advice”, Les Grandes Pianistes et le Piano, Wholenote Magazine, Musicweb, and Soundstage. Dr. Turgeon’s performances and recordings have appeared on classical top ten lists. Sinfonia Toronto is set to launch its 2018-19 season, the orchestra's 20th Anniversary, on Saturday, October 20, at the Toronto Centre for the Arts. The concert titled ‘Beethoven’s Kreutzer’ will feature two internationally-acclaimed stars: one of the world’s finest trumpeters, Sergei Nakariakov, and the brilliant piano virtuoso Maria Meerovich. They will team up in Shostakovich’s Concerto for Piano, Trumpet and Orchestra. Mr. Nakariakov will also perform Mozart’s Concerto for Horn No. 4. Music Director Nurhan Arman will conduct Sinfonia Toronto in his own orchestral transcription of Beethoven’s Kreutzer Sonata. This season Sinfonia Toronto will continue presenting its four-concert Downtown Concerts at Glenn Gould Studio and its three-concert North York Concerts in George Weston Recital Hall at the Toronto Centre for the Arts. The orchestra will also present programs for schools in Toronto's Neighborhood Improvement Areas and continue its annual performances for the Barrie Concert Association and the Algoma Concert Series in Sault Ste-Marie. Season highlights include appearances by violinists Alexandre Da Costa and Andréa Tyniec; the North American premiere of Peteris Vasks’ Viola Concerto with violist Marina Thibeault Perso; Toronto composer Christos Hatzis’ Arabesque and the Canadian premiere of Alan Hovhannes’ Harp Concerto with harpist Valerie Milot. Acclaimed as “A World-Class Orchestra” (review headline, Russelsheimer Echo, Germany), Sinfonia Toronto is one of Canada’s finest chamber orchestras. Now entering its nineteenth season, the orchestra performs its Masterpiece Series downtown at Glenn Gould Studio and in North York at the Toronto Centre for the Arts. Sinfonia Toronto inspires Toronto students each year with its interactive ‘Concerts under Construction’ program, focused on presenting in high-needs schools. The orchestra’s repertoire includes all the major compositions for string orchestra from the Baroque through classical, romantic and 20th-Century works. Sinfonia Toronto has premiered many new works, and has been praised by the Canada Council for its commitment to performing music by Canadian composers. A registered charitable organization, Sinfonia Toronto is supported by a board of directors representing many facets of the community and by the efforts of its dedicated volunteers. Its mission is to make the great wealth of string orchestra and chamber orchestra repertoire accessible to audiences in Ontario and beyond, and to create opportunities for young people and audiences outside traditional venues and metropolitan centres to connect music with their lives. The orchestra has performed for thousands of people at festivals such as Nuit Blanche, the Summer City Festival and Junction Arts Festival. It offers free events during Culture Days and has collaborated with cultural organizations from nine different multicultural communities across Toronto. 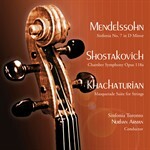 Sinfonia Toronto’s CD of music by Mendelssohn, Khachaturian and Shostakovich is broadcast frequently on Classical 96.3 and other classical stations. Their world premiere of the rediscovered Bach aria ‘Alles Mit Gott’ is available on iTunes. Flanders Fields Reflections, their Marquis Classics CD of music by John Burge, won the 2009 JUNO for Best Recording of a New Classical Work. Two additional CD’s, Hollywood Flute and Premieres (featuring Toronto violinist Conrad Chow) were both recorded by the California label Cambria and are distributed by Naxos. Sinfonia Toronto has concertized throughout Ontario. It has performed on the Barrie Concert Series every season since 2001, and was the annual Orchestra in Residence for Barrie’s Colours of Music Festival until the festival ceased operations. It has played on regional concert association series in Brockville, Gravenhurst, Lindsay, Peterborough, Port Hope, Sarnia and Welland-Port Colbourne and at Queens University, and is the only ensemble of any kind ever to be offered a regular annual engagement on the Algoma Conservatory Concert Series in Sault Ste-Marie. The orchestra has also performed in Montreal’s Place des Arts, and is returning to Montreal in October 2017. The orchestra has been active on the international concert circuit. In April 2015 Sinfonia Toronto made its first trip to the US. The orchestra’s 2008 tour in Germany generated review headlines such as ‘’Sinfonia Toronto Inspires,’’ and ‘’Sinfonia Toronto Thrilled the Audience,’’ and their two-week tour of Spain in 2010 was greeted with calls for encores at each performance, including a record-setting four encores demanded by the audience in Barcelona. Sinfonia Toronto made its fourth international tour in April 2018 touring in Argentina, Ecuador, Peru and Uruguay appearing in major concert halls and on prestigious concert series. In September 2019, the orchestra will make its first tour to China. Toronto - Today, Sinfonia Toronto announced plans for its upcoming April 2018, South American tour. Music Director Nurhan Arman will lead the orchestra in six concerts in Argentina, Peru and Uruguay. This will be the orchestra's fourth international tour. The orchestra has toured in Germany (2008), Spain (2010) and the United States (2015). World-renowned clarinetist Julian Milkis will be the featured soloist, joining Sinfonia Toronto for performances on the foremost concert series in each tour city's major concert hall. The orchestra will open the Sociedad Filarmónica de Lima's season on April 17 in Lima, Peru; perform four concerts in Argentina between April 19 and 26, in Buenos Aires, Cordoba, Rosario and San Juan; and conclude the tour in Uruguay on April 28 in the spectacular Atlantic-cape city of Punta Del Este. The tour is organized and managed by the US-based agency World Touring LLC. World Touring has promoted and tours orchestras, chamber ensembles and solo artists for three decades, with particular emphasis and success in the Far East, South America and United States. Sinfonia Toronto's South American tour is supported by a Touring Project grant from the Ontario Arts Council.